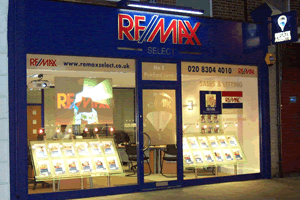 Welcome to RE/MAX Select, Estate Agents in Bexleyheath and Welling. We specialise in property for sale and to let in Bexleyheath, Welling, and surrounding areas. RE/MAX Select provides a comprehensive estate agency service offering highly professional assistance with residential properties for sale, to let, property management, property search and real estate investment. RE/MAX Select advertises your property on a global scale through our network of sister offices which means more exposure Read full description... for your property to consumers around the world. We are in 91 countries with over 6,300 offices. We advertise your properties on our global web site, global.remax.com, where details and descriptions are automatically translated in over 33 languages and prices are converted in more than 38 currencies. Bexleyheath and Welling are both areas sought after by families, particularly because of the many good local schools, and those seeking a short commute to London, at the gateway to Kent and its countryside. The fees were very competitive for a high street estate agent and definitely worth the money given the service we received. Well worth it due to the level of service received. David is professional as well as genuinely caring of his customers and providing the best advice possible. As a buyer I can't comment on agents fees. Fees were more than reasonable for the service received. Worth every penny. In all honesty, Other agents fees were slightly more competitive, but I wouldn’t change a thing about our experience. If paying a bit extra means a top class service, which is what we got, then it’s absolutely worth it. Dave was well worth the money!!!!!!! Agent fees were reasonable. Having a age you definitely took the stress away from me. Considering the overall service, I think the agent's fees were good. Should you have a reason to make a complaint, we have implemented the following complaints procedure to help us resolve your grievance and work towards continually improving our professional services. All complaints will be investigated and dealt with at no cost to the consumer. The complainant's legal rights aren't affected throughout the process. 1. Any complaint against RE/MAX Select (the Company) should be addressed in the first instance to the person with whom you have been dealing in respect of the matter giving rise to your complaint. 2. If you cannot obtain an explanation satisfying your complaint within 24 working hours, please do not hesitate to contact the appointed Manager listed below. 3. If your complaint has not been resolved at stage 1, or in the event of a complaint being made directly to those named below we will progress as follows. 4. If your complaint was originally made verbally we would be grateful if you could summarise the nature of your grievance in writing to the Manager listed below. 5. Once we have received your written summary we will acknowledge receipt in writing, normally within 3 working days to inform you of our understanding of the circumstances leading to your complaint. We may ask for more information regarding these circumstances and we will invite you to make any comments that you may have. 6. We shall continue our investigations into the matter and normally within 15 working days of receipt of your written summary the person dealing with your complaint will write informing you of the outcome of the investigation and let you know what actions have been taken or will be taken. In some instances your complaint may take longer than this to investigate, if so we will write to you to inform you of our progress. 7. If you remain dissatisfied with any aspect of the handling of the complaint, we will then attempt to resolve it promptly by negotiation. 8. At any stage or if the complaint has still not been resolved to your satisfaction we will agree its referral to the Ombudsman for Estate Agents.